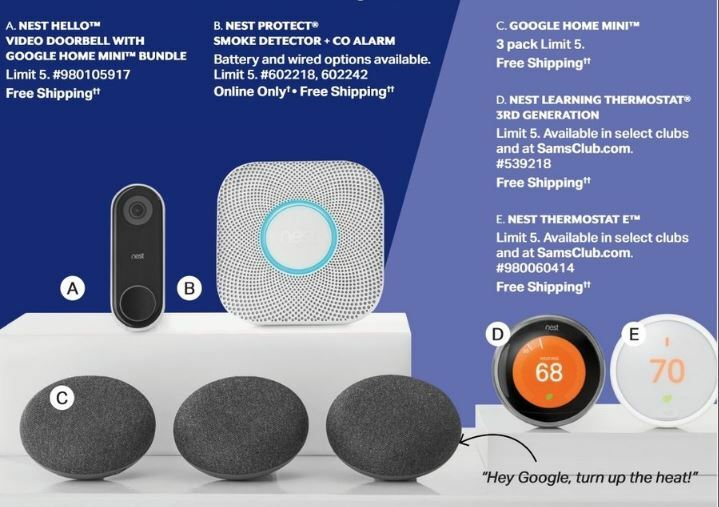 Find the best deals on smart devices from Nest during Black Friday 2019. 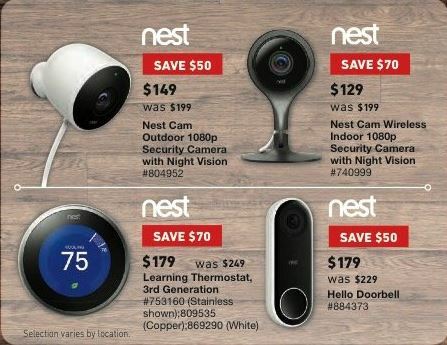 We will search for price discounts on the Nest Cam, Learning Thermostat, Hello video doorbell, Yale door lock, Protect smoke and carbon monoxide alarm among the online deals and leaked/released ads from Thanksgiving Day to Cyber Monday 2019. 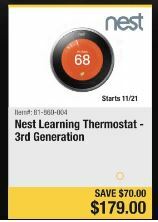 Smart Thermostats: The Nest Learning Thermostat and the Thermostat E. The Thermostat E offers a frosted display to blend in, the ability to control it from anywhere, and it turns itself down when you are away. 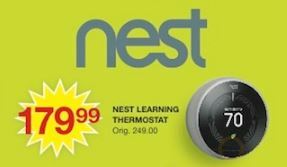 The Learning Thermostat is the third generation device that programs itself and pays for itself with the energy savings. Use the Temperature Sensor to get the right temperature right where you want it. 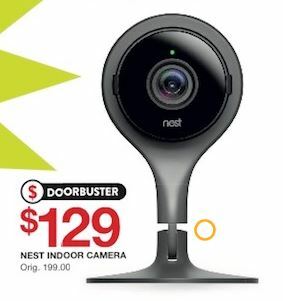 Security Cameras: The Nest Cam and Cam IQ offer indoor and outdoor video monitoring. 1080p HD video, Night vision, 3 hour snapshot history, plus alerts on your phone. Add up to 30 days of 24/7 video history to your Nest Cam with a Nest Aware subscription. The Cam IQ includes supersight and intelligent algorithms to distinguish a person from other objects, as well as built-in Google Assistant. 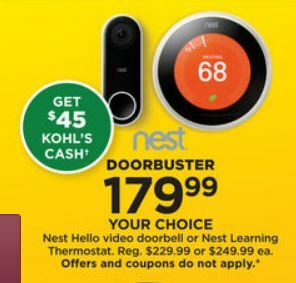 Video Doorbell: Nest Hello is the doorbell that lets you know who’s there. 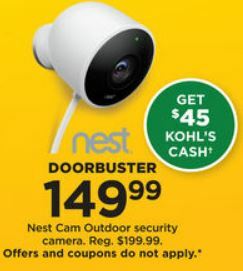 It replaces your existing doorbell and delivers HD video and images even at night. Includes streaming and continuous video recording rather than just clips by motion or sound. It can also recognize family and frends to send a special alert. 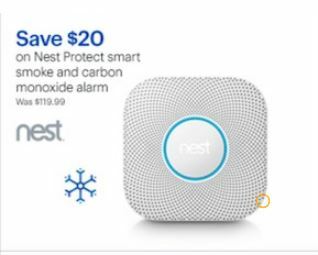 Alarm System: Nest Secure including the Nest Guard, Nest Detect, Nest Tag and Nest Connect offer the ability to keep your home secure inside and out. 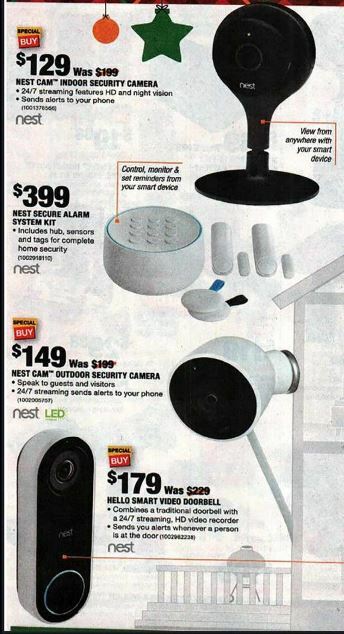 The Nest Guard is an alarm, keypad, motion sensor and central control of the system. The Detect looks out for doors, windows and rooms. The Tag is the easiest way to arm and disarm the system without a passcode. Combine the system with Nest Cams to always know what is going on in your home. Door Lock: The Nest x Yale Lock is made for people rather than keys. 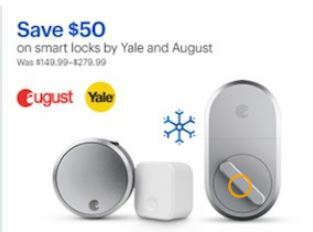 It’s a tamper proof, key free deadbolt that connects to the nest app so you can unlock your door from anywhere or give people you trust a passcode. It also allows you to lock your door with your voice. 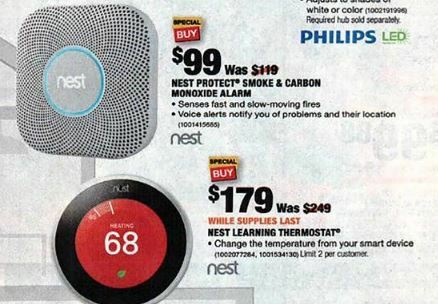 Connects through Nest Connect or Nest Guard. 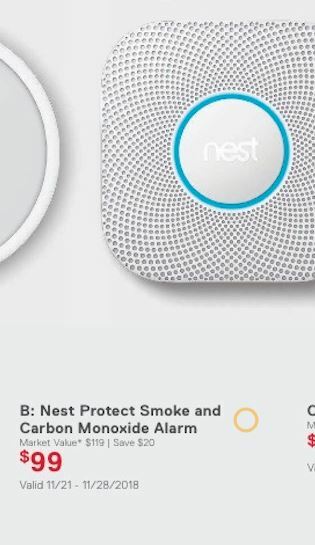 Smoke & CO Alarm: Nest Protect “is the smoke alarm other alarms look up to.” “The smoke alarm that thinks, speaks and alerts your phone”, according to Nest. Lasts up to a decade and tests itself automatically with the Split-Spectrum Sensor. Turn the alarm off from your smart phone with no extra hardware. 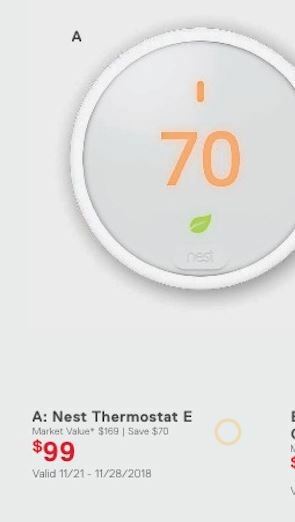 Nest Aware: According to Nest, it “catches everything you missed.” Nest Aware records 24/7 for up to 30 days and can send you alerts when your Nest Cam spots a person or your Nest Hello or Nest Cam IQ detects a familiar face. Three subscriptions are offered for 5, 10 or 30 days of video history. We will post all of the sales and discounts for Thanksgiving Day and the Friday after Thanksgiving here. 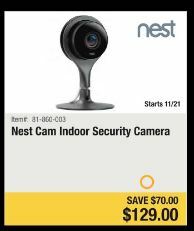 We will have all of the online deals for the Monday after Thanksgiving for the Nest products posted here when they are available.